A consensus based society, in theory, has a number of significant advantages. For example, although there are compulsory purchase laws in place to force the sale of a property, the government prefers not to use them but rather come to an understanding with all involved before a development proceeds. Anyone who has had to sit on an airplane at Narita airport for thirty minutes whilst it taxis to Runway Two has had to experience the pleasure of this particular compromise. A more recent implication though relates to the continuing decontamination following the Fukushima dirty bombs. 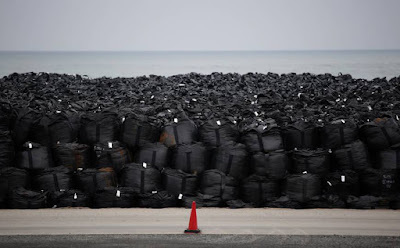 Top soil, removed from the towns and villages unlucky enough to have been downwind the day the reactors buildings went skyward, had been scraped away and collected into large vinyl storage totes (bags), each weighing around a ton. And then consensus kicked in and no one knew where to put them so they were piled high on a beach front in Tomioka. 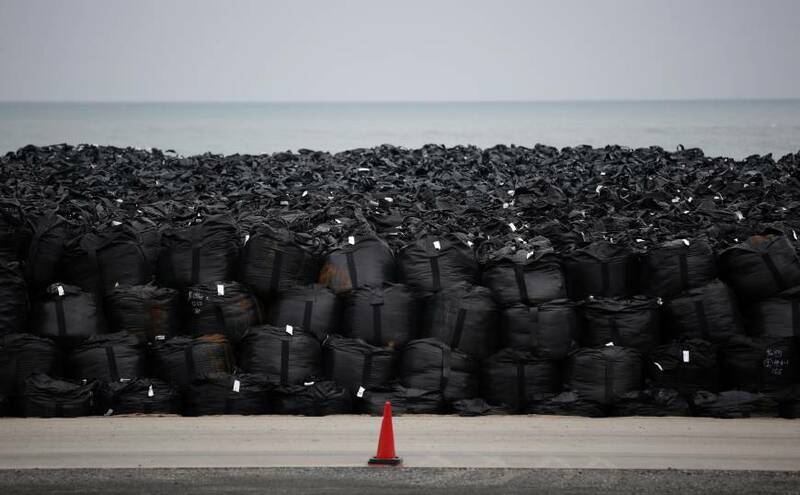 1,000 litre storage bags in Tomioka, Fukushima-ken.